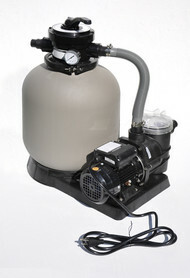 Hayward offers the very latest in pool filter technology ensuring your pool water is clear and clean. Their filters' simplistic operation and low maintenance requirements set new standards for performance, value and dependability. 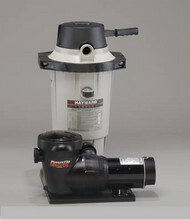 Molded of tough, durable, colorfast material Hayward filters deliver reliable, all-weather performance with minimal care. 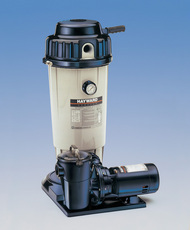 For aboveground pools and inground pools, small or large, there is a Hayward filter to suit your needs. Choose from the three most popular methods of filtration – Sand, Cartridge, and Diatomaceous Earth (D.E). 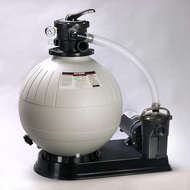 Hayward E-100 Aboveground Pool Sand Filter with 1 HP Power-Flo Pump - Hayward E-100 Series sand filter system features a Spherical Tank design for Superior Durability and Performance. 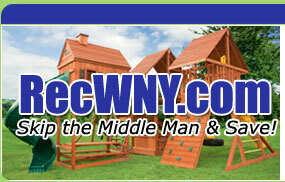 The E-100 is ideally sized for any aboveground pool that holds 10,000 - 17,000 gallons of water. 37 GPM Flow Rate. 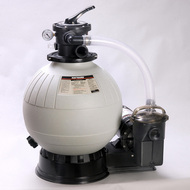 Hayward E-200 Aboveground Pool Sand Filter with 1.5 HP Power-Flo Pump - Hayward E-200 Series sand filter system features a Spherical Tank design for Superior Durability and Performance. The E-200 is ideally sized for any Aboveground Pool that holds 17,000 - 25,000 gallons of water. 63 GPM Flow Rate. 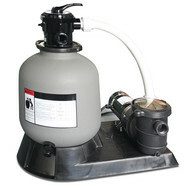 Hayward EC-40 Aboveground Pool Diatamaceous Earth Filter with 1 HP Power-Flo Pump - Hayward EC-40 Perflex Series D.E. filter system provides crystal clear sparkling water at an Economical Price. Effectively cleans Without the Need for Backwashing. 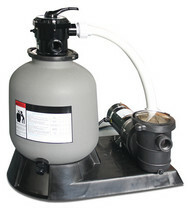 The EC-40 is ideally suited for any Aboveground Pool up to 15,000 gallons of water. 40 GPM Flow Rate. 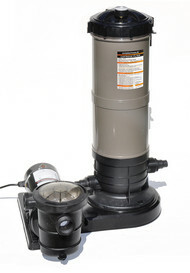 Perflex Series filters come complete with filter base, filter tank, quick connect union, and pump. 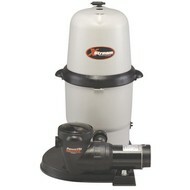 Hayward EC-50 Aboveground Pool Diatamaceous Earth Filter with 1 HP Power-Flo Pump - Hayward EC-50 Perflex Series D.E. filter system provides crystal clear sparkling water at an Economical Price. Effectively cleans Without the Need for Backwashing. The EC-50 is ideally suited for Aboveground Pools from 15,000 - 25,000 gallons of water. 50 GPM Flow Rate.